I’m holding my annual Days of the Dead blog tour celebrates Halloween, Samhain, Dia De Los Muertos, All Hallow’s Eve—you get the picture! It’s an online party—with downloadable party favors—and you’re invited! You can see where I’ve spread the goodies out across all my partner sites at www.ChroniclesOfTheNecromancer.com. I write what sometimes gets classified as “dark fantasy.” Depending on whose definition you use, that tends to mean it’s mostly adventure but with many of the darker elements that used to be reserved for horror. That can include malignant magic, gruesome deaths, supernatural monsters, and a sprinkling of natural disasters. So it’s a logical question to ask: which scenes that I’ve written creep me out the most? Writing is a cheap form of therapy. The trade-off is that when you’re published, it’s also public, kind of like putting yourself on the couch in the display window of a department store. If an element doesn’t bother me, I’m not likely to put it into a story, because I won’t be able to rely on it moving a reader. Luckily, I’m not in danger of running out of material, as I’m rather easily frightened. I really don’t like driving or walking around alone in the dark. I’d like to think that I’d be a lot braver if I were a martial arts expert or a Navy SEAL, but the truth is, unless you’re fully encased in body armor and heavily armed, bad things can happen to you when you’re alone in the dark. So of course, my characters find themselves in situation after situation that requires wandering through dangerous territory in darkness. Serial killers creep me out. (And if they don’t creep you out, please don’t tell me, because then I’ll be a little creeped out about you.) The Buka character in The Sworn and The Dread was a Ripper-esque psychopath who terrorized a city that was already on its last nerve. He was important to the plot, but I can’t say I enjoyed writing his sections. I’m a mom, so I really hate it when bad things happen to kids (or dogs). The scenes in my books where innocents get hurt are the scenes that I find most disturbing to write, but they’re necessary to establish the stakes of the game, and to evoke the reader’s understanding of why the hero will go to extremes to eliminate the perpetrator. I think that writers write about things that scare them as a way of gaining control over the unknowable. 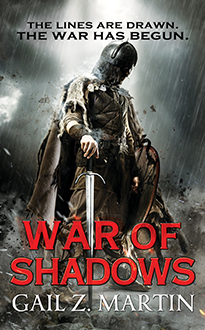 And I suspect that readers read about things that frighten them because it imparts a sense of vicarious victory when the good guy beasts the evil in the shadows. So here’s to the things that creep us out, without which stories would be a whole lot safer—and much less interesting. Days of the Dead—Get Ready for Ice Forged! For any fan of the supernatural, this week is the best time of the year. Samhain, All Hallow’s Eve, Halloween, Dia De Los Muertos all in one week—what’s not to love? What’s up this year? 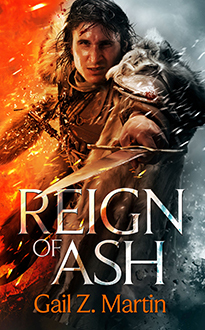 For starters, Ice Forged—the first book in my new Ascendant Kingdoms series—will launch January 8. It’s available now for pre-order, but you can read four different excerpts for free on my Days of the Dead partner sites—and three sites will be offering giveaways where the lucky winners can get their hands on a copy right away! I’ve also got two new short stories in two different UK anthologies, Magic: An Anthology of the Esoteric and Arcane (from Solaris Books) and The Mammoth Book of Women’s Ghost Stories. And even better, I’ve got free excerpts! Drawings for signed copies of Ice Forged, so make sure you enter—you can’t win if you don’t play! Solaris Books (www.SolarisBooks.com)—Author interview about my short story universe, plus an excerpt of my story from the Magic anthology, “Buttons”. Magical Words—(www.MagicalWords.net)—A guest blog from me on “When Magic Goes Off the Grid” plus a different excerpt from Ice Forged. DoubleDragon Books (https://www.double-dragon-ebooks.com/)—a Q&A with me on “Characters of Questionable Virtue” plus a third different excerpt from Ice Forged. 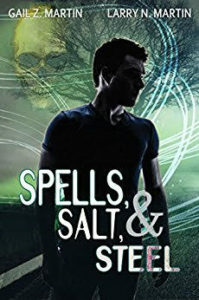 Laurie’s Thoughts and Reviews—Paranormal Edition 10/28— (https://lauriethoughts-reviews.blogspot.com/) A guest blog post from me on “Why I Still Write About Heroes” and, you guessed it—excerpts! SandraSaidak.com—A guest blog post from me on “Middle Ages Crisis—Apocalypse Then” plus excerpts! 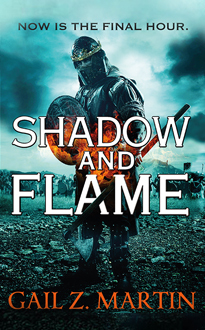 Pat’s Fantasy Hotlist https://fantasyhotlist.blogspot.com/—another chance to win an advance copy of Ice Forged! The BroadPod (https://broadpod.posterous.com/october-2012-unnatural-and-undead) and GhostInTheMachinePodcast.com—A reading of one of my favorite vampire scenes in The Dread plus a link for an excerpt from The Dread on Ghost in the Machine. 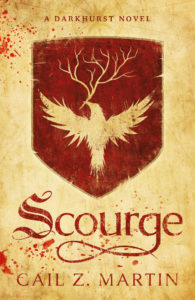 ChroniclesOfTheNecromancer.com—A special Q&A with me about scarred heroes, and a different chapter excerpt from Ice Forged, and sample chapters from books by several of my author friends! Plus an excerpt from my story, “The Low Road” and more! TheWinterKingdoms on Facebook (please “like” my page!) 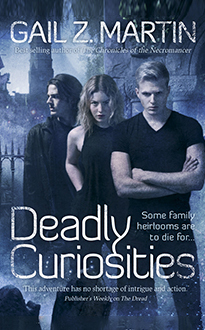 a Q&A with me about where ideas come from, plus the full short story “Vanities” for free! DisquietingVisions.com—a blog post on “The Stuff of Nightmares”—the scenes I’ve written that creep me out—and more excerpts! Twitter.com/GailZMartin—Links to two more of my short stories, “Steer a Pale Course” and “The Low Road”, plus links to downloads from some more of my awesome author friends! Remember—each partner site with an excerpt from Ice Forged has a different excerpt! 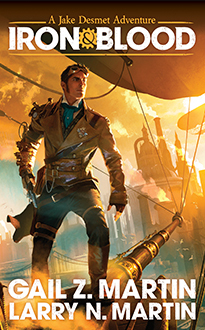 Lots of news—and a chance to get your hands on Ice Forged! I’ve been quiet for a while, but there’s a good reason! 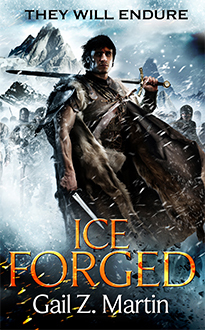 I’m finishing up the sequel to Ice Forged—and Ice Forged won’t be in stores until January 8! 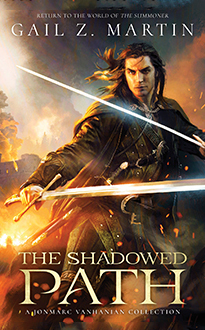 Oct. 13 – 14 I’ll be one of the guest authors at the Carolina Renaissance Festival. 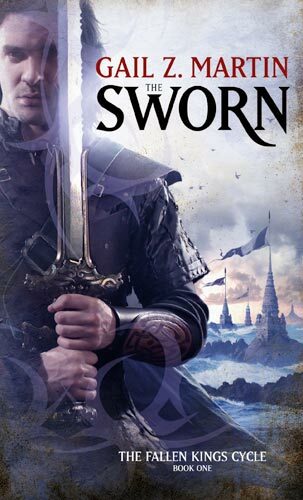 I’ll be signing copies of The Sworn and The Dread, and I’ll be doing a drawing for an advance copy of Ice Forged! Oct. 24 – 31 is my annual Days of the Dead blog tour. I’ll have more details soon, but you can count on excerpts from Ice Forged (and some giveaway advance copies! ), all-new interviews and Q&A from me, a new podcast or two, and some surprise “treats” from my fellow authors in the form of free downloadable excerpts! Watch for details by email, on Facebook at The Winter Kingdoms and on my www.ChroniclesOfTheNecromancer.com site. Nov. 9 – 11 I’ll be at Philcon in Cherry Hill, NJ—I don’t know my panel schedule yet, but I’ll post it on Facebook once I get it. I’ll be doing some cool things on GoodReads for Days of the Dead and for Ice Forged’s launch, so if you aren’t already connected, please “friend” me to be in on the news! And if you haven’t “liked” The Winter Kingdoms on Facebook, that’s another place to get some exclusive goodies!